FREE White Papers From GoldVision! National research shows that as much as 50% of an employee's day is spent looking for a document or file, either in their office or on their computer. While orderly paper filing systems have been created over the years, most computer files are stored in a very disorganized fashion, without standardized naming conventions or built-in retrieval capabilities. Critical information created at considerable time and cost is stored with little or no association to its business relationship or subject matter. Practically speaking, only the employee that has created or edited the file holds the keys to retrieve that information. And paper filing systems are an expensive drag on productivity in an increasingly competitive world. 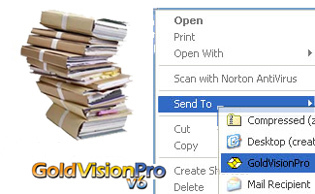 GoldVisionPro immediately creates a valuable company-wide benefit, enabling every employee to instantly access ALL of an organization's information. The program’s comprehensive, automated features make it easy and intuitive to quickly store, manage and retrieve every file throughout your entire system. Enable your staff to spend their time working on the business at hand, rather than wasting time constantly looking for the information they need. Vastly increase productivity with quick and powerful retrieval capabilities for letters, spreadsheets, faxes, photos, recordings, scanned documents, presentations, or anything related to your customer, product, service, employee, sale or subject.